•	Manufactured in the latest fashionable soft brushed velvet style polyester durable fabric. •	Fully upholstered in fashionable soft brushed velvet style polyester hard wearing fabric, which pro-vides extra comfort. •	Hardwood frame providing great support. •	Wooden feet add a traditional style to this piece of furniture. •	Quality fire-proofed dense foam and pocket springs ensure a very comfortable seat. •	Fully compliant with UK fire regulations. Upholstered in a crushed velvet effect and is a hard wearing polyester fabric, the St Moritz will bring fashionable look to any living room. 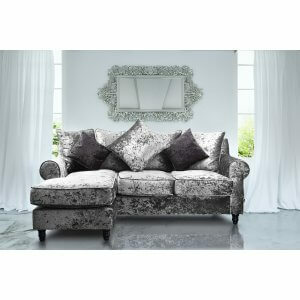 • This beautiful corner sofa has a reversible chaise so can be set up on either side. • Solid hardwood frame and soft permafoam cushions. • Corner is coming with both silver and black cushions. • This corner is upholstered in a crushed velvet effect and is a hard-wearing polyester fabric. 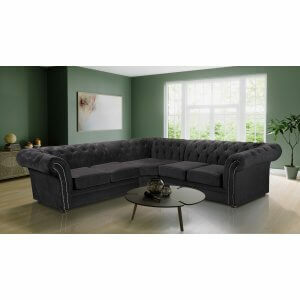 Black Crushed Velvet Corner Sofa • The Westwood has deep chesterfield buttoned arms that are also overstuffed. • Soft foam padded seating and large scatter cushions. • Crushed velvet style polyester fabric. • Glitz and glamour. • Chrome style feet. • Hard wood frame. 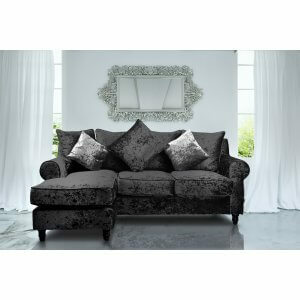 Black Crushed Velvet Corner Sofa • The Westwood has deep chesterfield diamante buttoned arms that are also overstuffed. • Soft foam padded seating and large scatter cushions. • Crushed velvet style polyester fabric. • Glitz and glamour. • Chrome style feet. • Hard wood frame.